We’ve got another wave of Reaction Figures hitting stores. 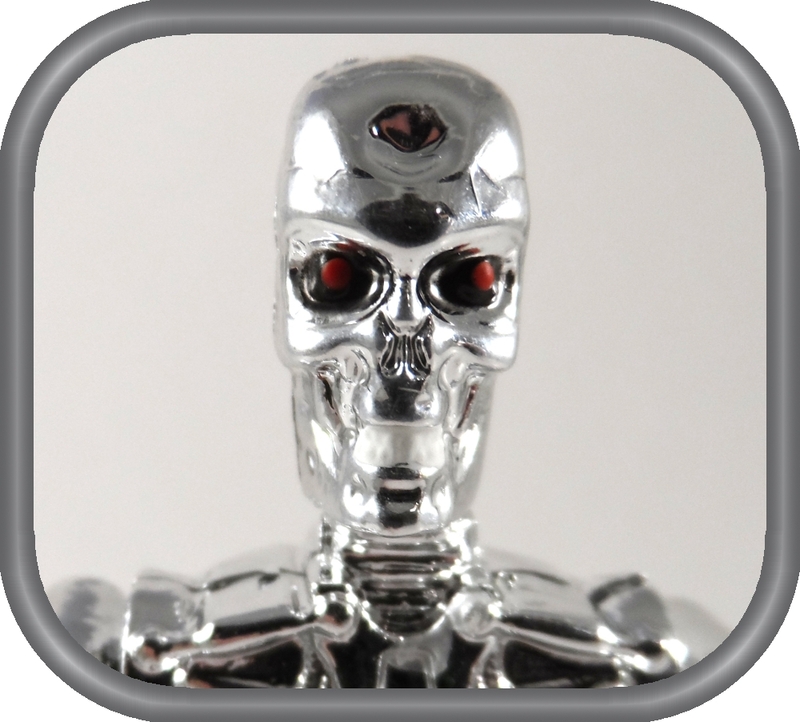 This time we’re looking at the chrome version of the T-800 Endoskeleton from the Terminator movie. The package for the T-800 Endoskeleton uses the cover of the movie poster for the artwork and reminds me a lot of the old VHS tape case. 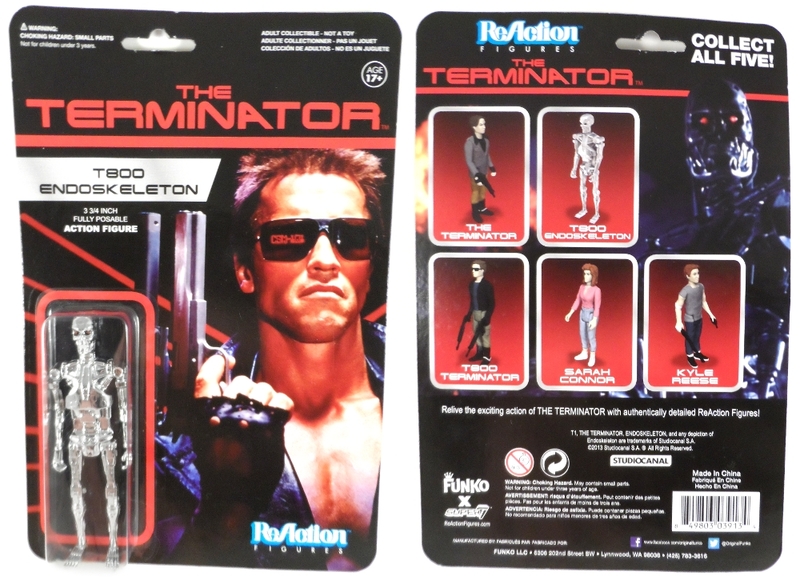 The back of the card shows the 5 different figure sculpts in the Terminator line. 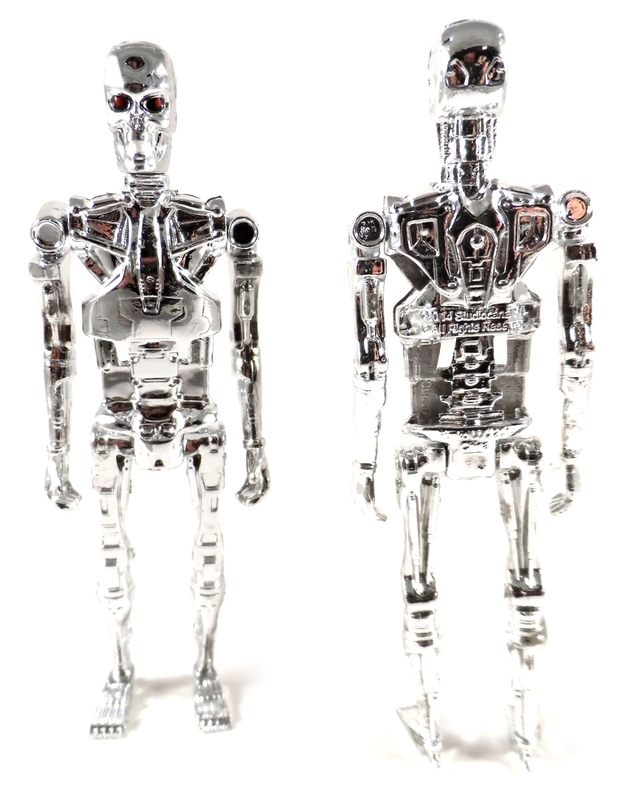 The T-800 Endoskeleton comes in two different decos. Silver paint and Vac Metal Chrome. We’re looking at the Chrome one today. You can see that the sculpt is very good with a lot of fine details for this style of figure. The chrome looks really good too and gives you the look of the endoskeletons from the movie. My figure has a few points here and there (mostly where the parts were attached to the plastic tree) that aren’t chromed or have a rough spot but given the reflective nature of the chrome, you don’t notice these areas that often. The head is an ok sculpt (and oddly enough the first one of this size that has the mouth closed) They eyes are painted black with red pupils and for some unknown reason, the teeth are painted white. The T-800 has the basic 5 points of articulation all of the Reaction figures have. He has holes in his feet like the Aliens and Rocketeer figures, but due to the nature of the plastic being rigid (to allow for the Vac Metal Chrome) the foot holes won’t fit on vintage sized GI Joe pegs like the other Reaction Figures. 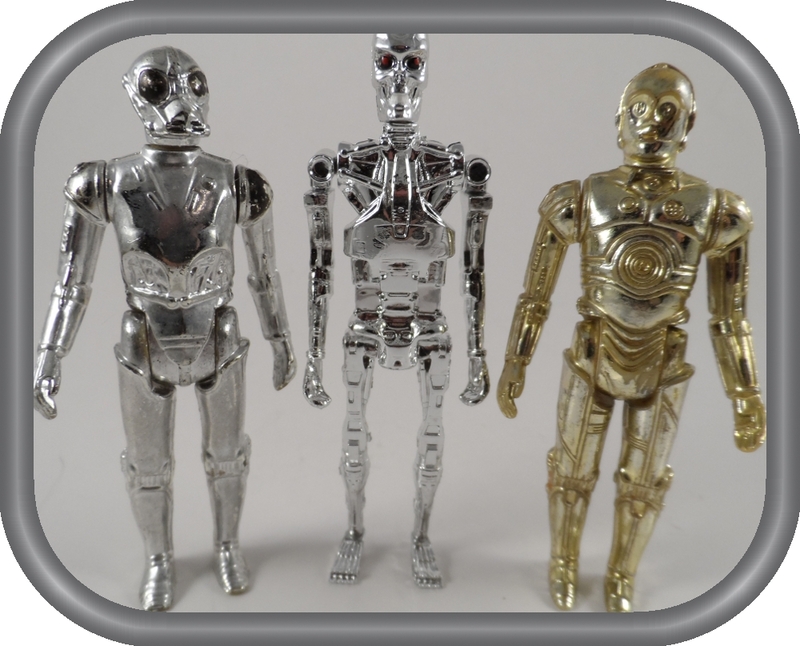 Since these Reaction figures are based, in part, on the vintage Star Wars figures, I thought I’d look at how the T-800 looks with other chromed vintage figures. I’d say the chrome stands well right now (let’s wait to see how it holds up after 35+ years) and the figure blends well with the Death Star Droid. I will point out that the sculpt has the figure posed a little too straight up and down for my tastes. The Star Wars droids have a slight bit of space where the arms go out from their torsos at an angle while the T-800’s arms go straight down from the shoulder. I feel this posing gives the figures a more natural look rather than the stiff as a board, toy look the T-800 is pulling off. 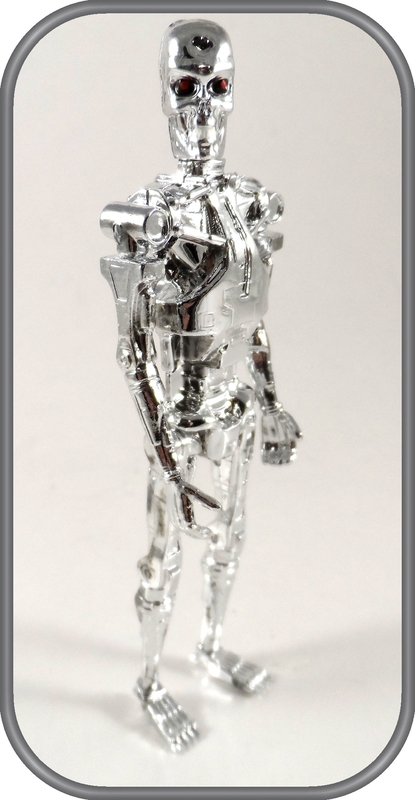 As far as I know, this is the first 3 3/4″ Terminator Endoskeleton figure that is chromed. As you can see the sculpt is about on par with the other two figures we’ve gotten over the years. This is also the only one who can turn his head, although the other two figures have more over all articulation. 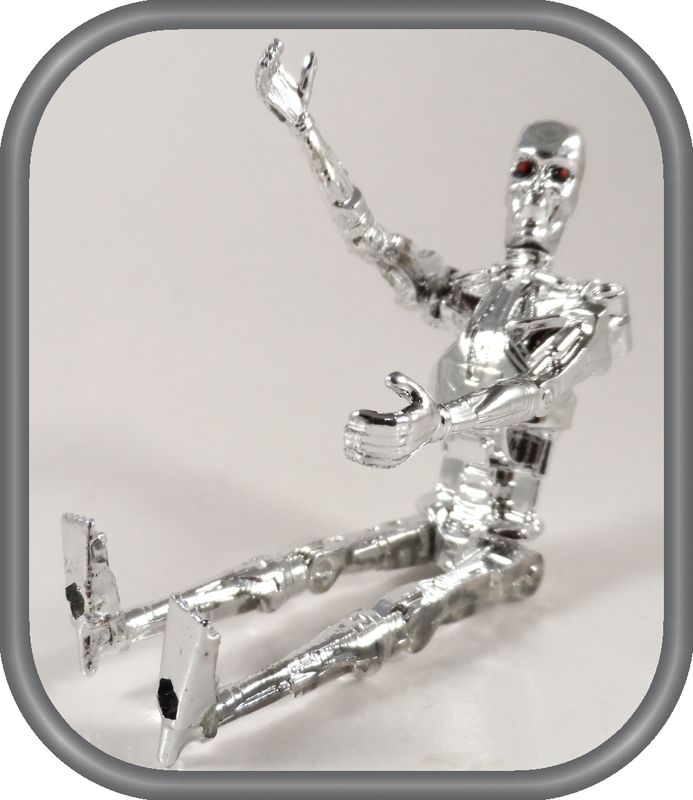 The Reaction T-800 falls firmly in the middle of the rankings of best to worst 3 3/4″ Terminator Endoskeleton figures. The chrome and sculpt make it better than the old Toy Island figure, but the Terminator Salvation figure from a couple of years ago is still the best articulated and has the most detailed sculpt of all three. The chrome T-800 is a nifty little figure. I really like the chrome look to it and it has a decent sculpt. It’s definitely one of the more detailed figures in the whole Reaction Figures line. At $10 a pop, it’s not a bad purchase if you can find it. 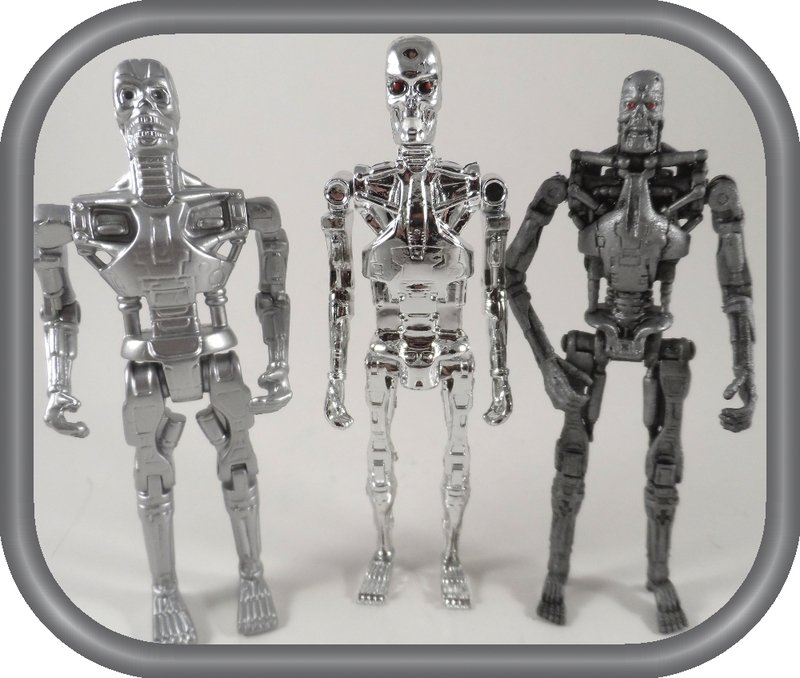 I imagine the Endoskeletons may be the first of the Terminator line to disappear from the shelves, especially the chrome ones.